placed 1st place with this house. 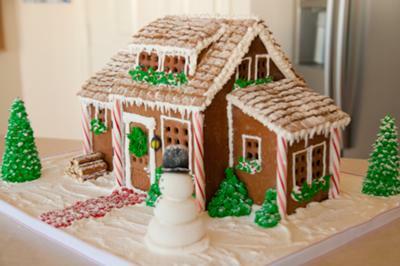 this is my second gingerbread house(last christmas). i found inspiration looking through images here and on flickr. decided to build this one. i didn't have a pattern for it (although i know it comes in a book). i didn't have time to order it so i just made my own template and did the best i could (what a headache! props to those who make them). this is an addictive hobby and can not wait to be able to do it with my kids. i'm working on a haunted house right now. came here again to see if anyone posted any. anyway, i entered it in a gingerbread competition and tied first with another girl (who had an amazing house). won a $250 gift card. i'm just sad i didn't get to keep it, (it was auctioned off for breast cancer). never had time to make another one. this year i am starting early! lol. 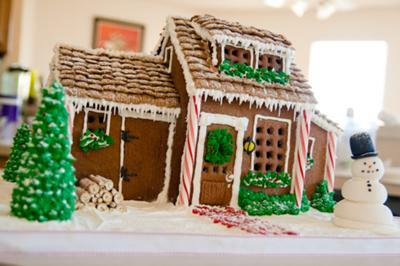 <3 gingerbread houses. wish there was a reason to make one every month! used wheat chex for the roof, powdered sugar for the light dusting of snow, snowman is made out of fondant, trees are ice cream cones with royal icing (with one of those star tips), and pretzels for logs.